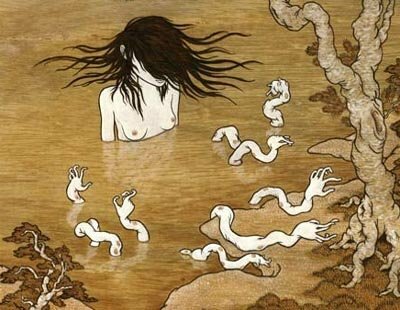 Lots of Miyazaki influenced artwork of surreal creatures and unusual characters. The site is confusing to navigate and as it's a flash page I can't direct you to anything specific. I will say though you should not miss the galleries connected to the words "cloud, wood and blacksnow". Here is a link to an interview with Moki and another artist. Rediscovered thanks to Drawn!